Last summer I was browsing on Facebook and came across my friend Hope's album entitled "This is Africa." After looking at every picture about 3 times, I emailed her and basically stated, I didn't know anything about those pictures or the background of her trip but I knew that I needed to be apart of it. Hope began telling me about this wonderful organization based out of Charleston, SC where she lives and I visit on the reg. After reading on the Palmetto Medical Initiative's website, I knew I wanted to be apart of their volunteer family. Hope then gave me the contact information for PMI. Via email, I presented my case: I've never been on a medical mission, I'm not in the medical field but I have traveled the world since I was 15, I can adapt well to new and changing environments, I already volunteer in my city, I love children, I like photography, I can lead and lastly, I'm eager to help PMI. I was told I would be a great candidate and was asked to fill out an application. After my application was sent in I started thinking this trip would be a life changing experience no matter how you slice it, but it would be much more than that, if I have someone to share it with. Someone I knew. This is when my dear friend Katie Rothwell comes in. Toward the end of January, we decided our new years resolutions would be something achievable, tangible, something we really wanted- for us. For various reasons (insert boys, breaks ups, life evaluations, self fulfillment wants, being 30, always putting off things we want to do, etc) we decided 2014 was the year about us. We would do what we wanted. We would be honest with ourselves and others. We would practice tough love when need be. We would dig deep to find what makes us happy. We would just do what felt right. We would take one trip a year. I asked Katie, just once, via gchat "Hey do you want to go to Africa with me?" Much to my surprise "Well, yes I do" is the response I got. 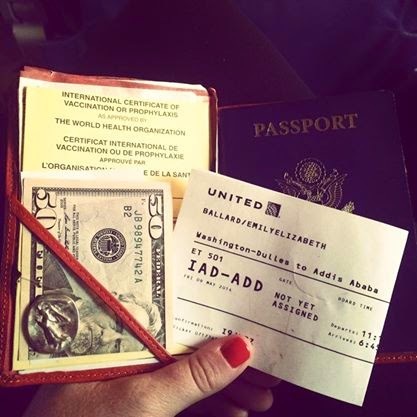 From there on out, Katie and Emily were going to East Africa for 10 days in May of 2014. Once everyone was accepted we got a welcome email with a ton of information: What to pack, what not to pack, what vaccinations to get, facts about Uganda, safety measures, how the week would play out, etc. Our group of over 70 was going to be the largest PMI had ever taken. We all received weekly emails with updates, check off list, reminders and motivation. I found these emails very helpful and very informative. In most cases, if I had a question the weekly email or docs sent to us in the welcome email covered the issue. Some odds and ends of a few of those emails were: absolutely no hairdryers, no shorts, no tank tops, $50 entry fee into Uganda and must be one solid $50 bill dated after 2007. Then, it was time to figure out how to pay the $3,650.00 cost of the trip. While yes that is a lot of money, that cost covered the entire trip: Flight, transportation, guards, hotel, all meals, thousands (literally) of bottles of water and safari. Suggested spending money was $100 USD. PMI set each volunteer up with a fundraising page. Here you could give a brief description on the trip and keep track of your funding. We decided we would take advantage of every avenue we had in front of us: Email, Facebook and sending letters through the good ole US Postal Service. We both received an overwhelming amount of support from friends, family and some people I didn't even know. Because of their generosity, I was able to raise double of my goal! I was really touched how generous people can be. It was a nice feeling to have all the money raised by the first deadline. Africa week finally arrived and I could now start packing up the piles of stuff on my dining room table. Of course more than half the stuff was left behind. We were allowed to bring one carry on under 40 lbs and one personal bag. I opted for a travel backpack and one travel day purse. My sweet mother doesn't like for me to leave the country without a hug, a kiss, a see you later and a tearful yet happy wave at the airport. This being the case for well, my entire life, she drove up Thursday night to help me get things in order. My sister in law, Mom and I went to my "last supper" at Ruth Chris where my brother runs the kitchen. We ate like queens: appetizers, salads, steaks, seafood, veggies, and wine (no wine for the Mama Bear). Having that as my last meal, really began to put things in perspective. Barely being able to walk from full bellies, we make it back to my house and double, triple check the packing list. We needed to leave my house no later than 4:45 am, so I hopped in bed pretty quickly. Mama Bear being Mama Bear, was fearful she wouldn't wake up, so she stayed up. I imagine a lot of hallmark movies and driving around town filled those 6 hours I was sleeping. 4:15 am rolls around and I wake to my alarm and Mama Bear kissing me on the forehead whispering "it's time to go to Africa". By 5:45 I'm in line to board and heading to DC to meet up with the PMI crew. I couldn't wait to see Katie! The international gate at Dulles is not great at 7 am. Only couple places are open, the people watching is not plentiful and there were 100 people in line (with and without us) at the counter once the gate opened, trying to check in and ask questions. Katie and I decided for the flight over it was imperative we sit beside one another. Thanks to the very nice man for breaking the rules, he switched some things around and made that happen. It never hurts to ask. While checking in and changing our seats we are told not just ours but almost everyone's bag is too large for the "carry on" size. Despite being told if it was under 40lbs we could carry it on. Now everyone in line is taking out the must haves and regrouping. Katie and I just looked at one another, like 'well, we hope our bags make it.' It was nice not to have to lug around that big backpack though! We got settled on the plane and the reality of it becomes apparent. We are going to Africa and we are going to be on this plane for about 15 hours, before changing plans for the last leg that actually would get us to Uganda. Movies and meds (to help us sleep and keep anxiety low) was the plan to get us through. Even with assistance, the flight seemed like days, so rationing the meds and strategically playing movies was a must. The plan was for Katie to be window for 7 hours and then switch and I would have the last 7 hours. Well, that didn't happen. This gal was stuck in the middle the entire time. Katie's shoulder proved to be a great perch! Everything about international airlines are more or less better than domestic ones. The planes seem nicer and cleaner, the seats seem bigger, free tv and music, more and better food and drinks, and the flight attendants are much more friendly and accommodating. The Ethiopian attendants were all women, dressed in pretty white embroidered dresses and they all wore red lipstick! 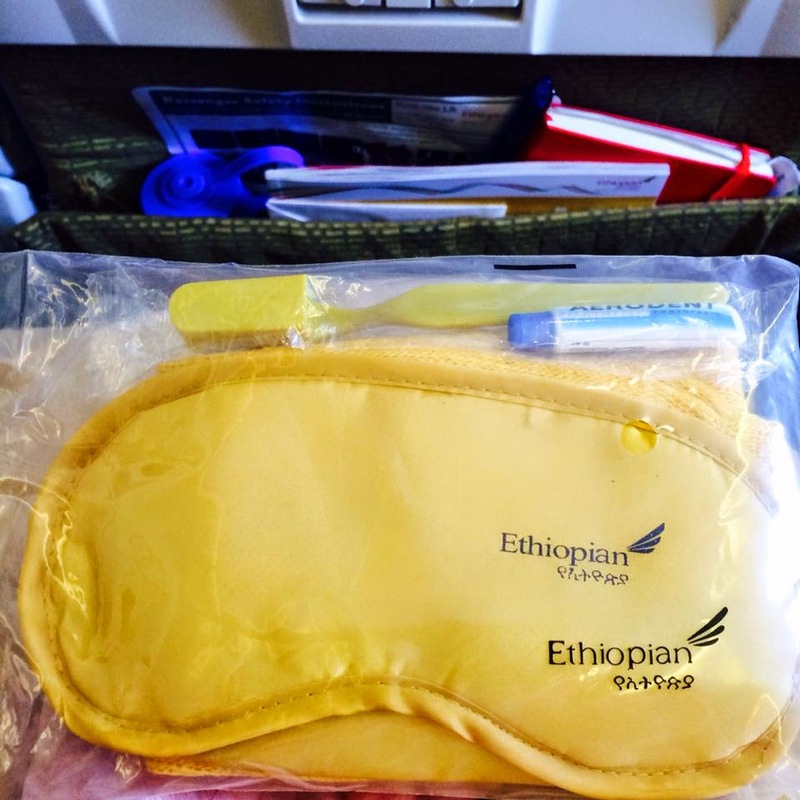 They even gave us eye mask, toothpaste and toothbrush! No need to forgot about our pearly whites. beef, rice, veggies, bread, pasta salad, coffee bread,fruit, chicken and cheese sammie, veggie pita, and oatmeal. Several movies and lots of naps and music later we started descending. 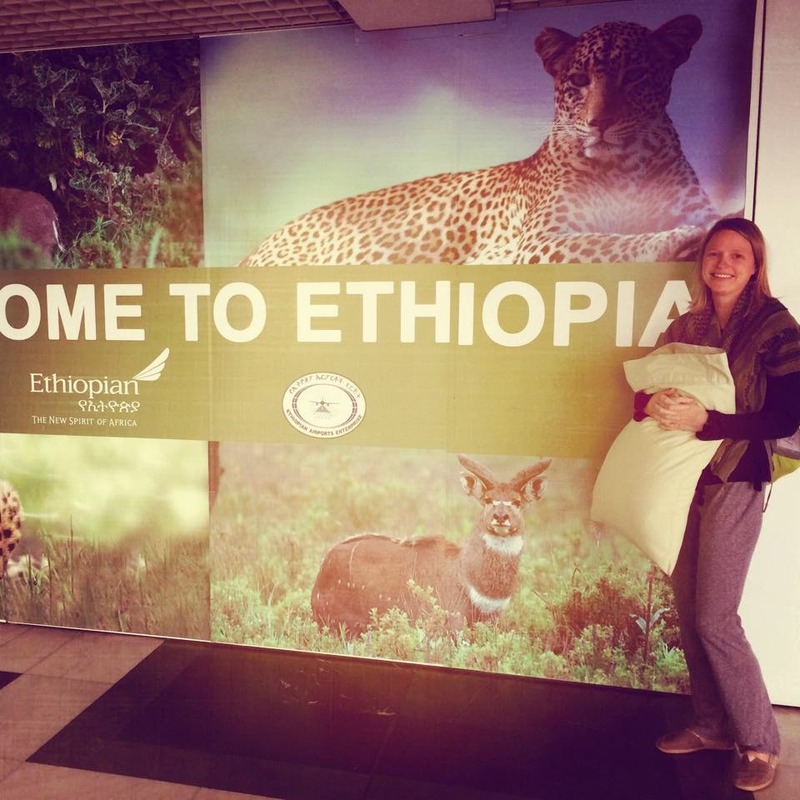 It was 10:45 am (3:34am back home) Saturday, May 10th and we had arrived in Ethiopia. Yay! We were in Africa. Boo! We still had 1.5 hour layover, 2.5 hour flight and a 6 hour van ride/drive. I've been to some pretty dismal and basic airports, but this one wins. One building. Hundreds and hundreds of people. No real place to get food or drink. One duty free, two local shops. One security line. Two public bathrooms, that were clean. A prayer room for men, A prayer room for women. Ample seating, make it not as bad as it could be. Security was slack, no one looked at my passport. We landed in Uganda at 1:15. Katie and I quickly grab our luggage and head outside, not sure why we rushed because it was 45 min later until we saw another person from our group outside. Simon with his PMI t shirt on found us (clearly we stand out) and guided us to the vans. There were 7 vans, 7 drivers, 7 armed guards. He told us to put our backpacks down to start the luggage pile and to put our pillows on the van seats... the front (second) row. We followed directions not knowing Simon would soon be our favorite person. His van, #6, had the most leg room! While waiting for the luggage to be organized and put on top the vans we walk to the latrine. Wow, we are not at home anymore. It's a masonry building with private stalls, but just a hole in the dirt. I'll leave it at that. By 2:45 we are all loaded up and having no idea where our luggage is but trust it's on top of one of the vans. Windows are down to let in as much air as possible since we had no AC. The vans had 4 rows. Up front was the driver and guard and maybe someone in the middle, then three rows behind. 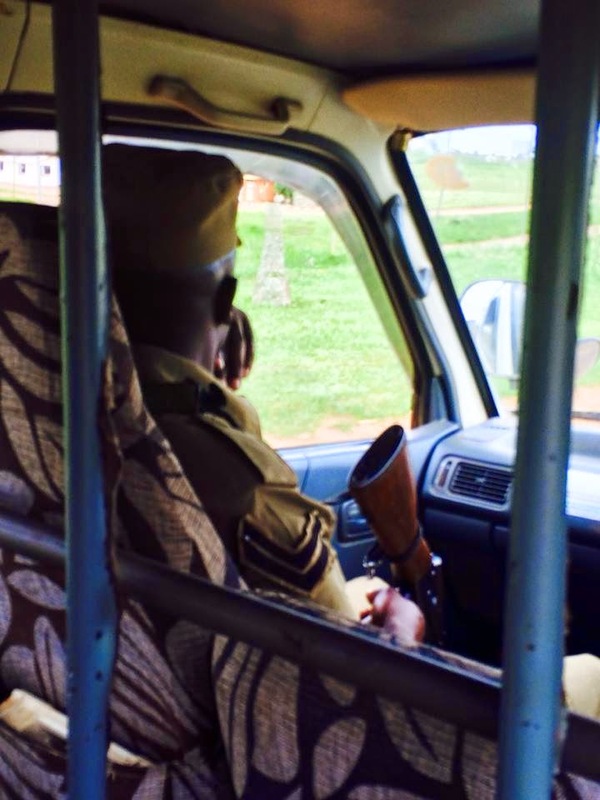 Our drive to Masindi was about 6 hours. 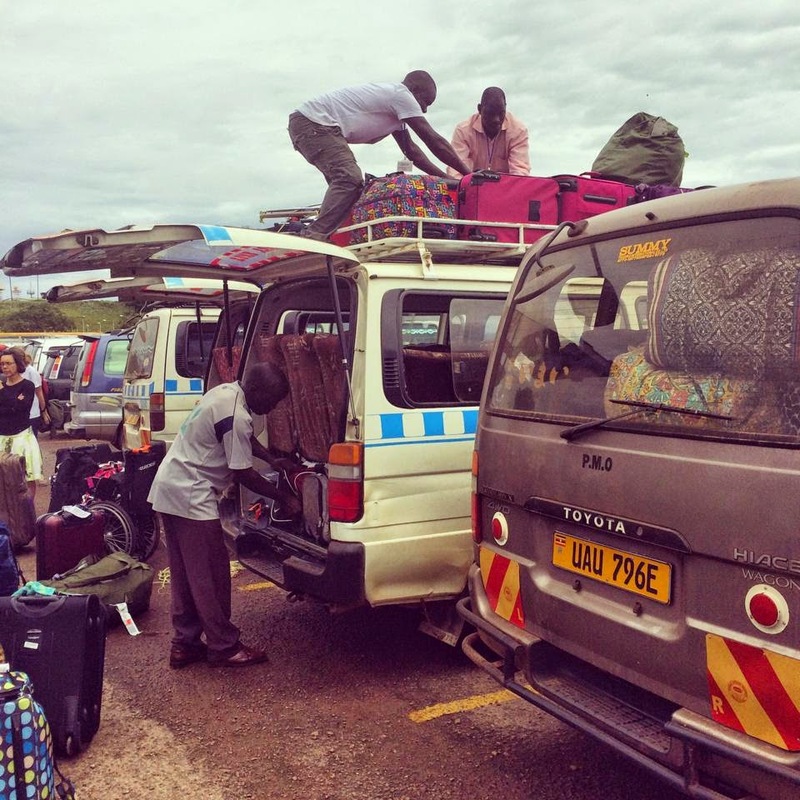 We left Entebbe, a city that sits on the coast, and drove through another large city, Kampala, before just passing through villages and small towns. The cities were intense. Traffic like you see in the movies, no lanes, no lights, no traffic signs, people doing what they want, when they want. People, thousands of people, lined the streets with open markets, fruit stands, furniture stands, building doors, selling motorbikes, veggie stands, selling carpet and people selling toilet paper- by the roll. It's like nothing I'd ever seen before. The closest thing I could compare those large cities to, is Bangkok (traffic and people wise). Along the way, we make two stops. The sun sets and we still had another hour and half before arriving at the hotel. When the sun sets it gets dark. Really dark. Zero street lights and just our van's head lights. We were in Uganda toward the end of the rainy season. This meant it rained early in the morning or later at night with the occasional mid afternoon storm. This time of year also meant cooler temps. During the day it was high 80s to mid 90s but a different heat. Equator heat. 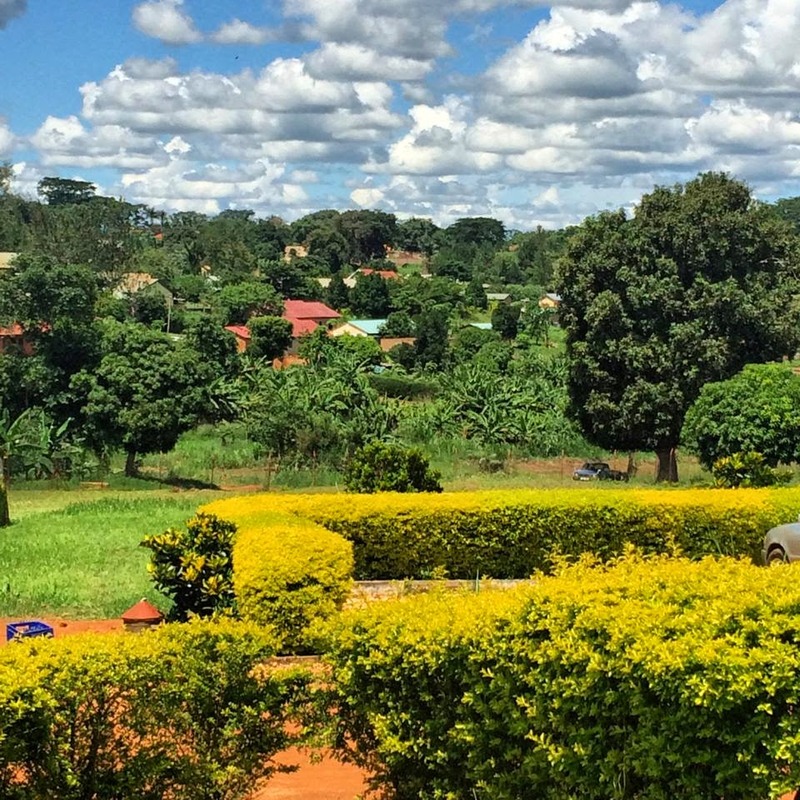 Despite being on the equator, Uganda is cooler than surrounding areas b/c of it's altitude. The evenings were cool. Long pants and a short sleeve did the trick. Due to where Uganda sits on the equator, the sun rises around 7 each morning and sets around 7 each evening all year long, give or a take a few minutes on either side. There are 12.5 hours of daylight each day. I let out a sigh of relief when we entered the Masindi Hotel's gates. We had finally arrived to our final destination! It was 8:30pm but we still had several hours before we could go to bed. First off, we had to wait for the luggage and week's supplies to be unloaded off the top of the vans, find our luggage, get room assignments (Katie and I were thrilled we got room together), and get the room key from the one receptionist. After everyone freshened up we gathered around two long tables for supper, we devoured spaghetti in meat sauce (or plain tomato sauce), bread, pineapple and sweet potato soup. We were served some sort of soup each evening- despite the heat. All meals were prepared by the hotel and served buffet style. Ha Katie and I thought we were going to shed a few lbs in Africa. That was not the case, if anything we gained a couple. Lots of bread, potatoes, rice, pasta, beef and fruit. Very little veggies. The hotel even provided the lunches that were served on site at the clinic where not that bad. I usually took a couple nibbles of whatever it was for lunch, ate the fruit and hoofed down a granola bar or snack brought by Katie and I from the U S of A. We went to bed Saturday, ready to begin the week! Our routine was pretty much the same Monday- Friday: Breakfast, devotion, van ride, clinic, van ride, freshen up, dinner, shout outs/ life story, prep for next day, bed. Of course each clinic day was different and exciting, but we knew what to expect for how the day would go as far as the order. PMI is a Christian faith based non-profit. Each morning we had a devotion. I really enjoyed these devotions because for me it set the tone for the day, gave me something to think about as I was volunteering, and I feel like it helped get everyone on the same page. Each evening we would do a couple min life story (different people each night, until everyone had gone) and shout outs to great things that happened that day, someone who went above and beyond. 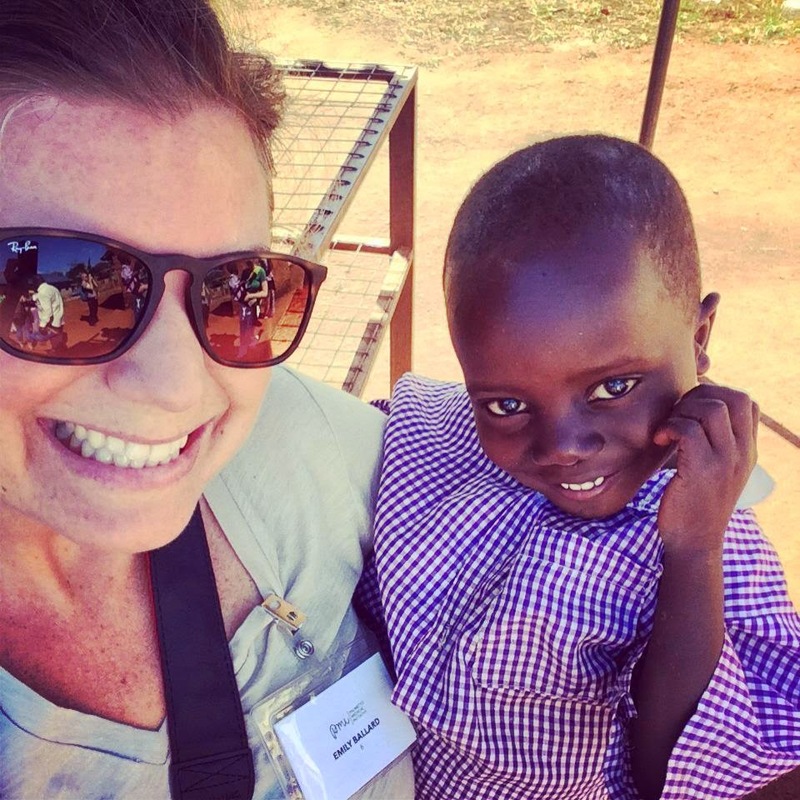 Since there was over 70 of us, and all kinda of with our own group, this was a great way to learn how each of us came to be in Uganda together. It's amazing the stories that brought us all together. Our alarm went off and by 8 am we were sitting eating egg omelets, toast with jam and peanut butter, and baked beans! Ha, I passed on those. Mid way through breakfast we had our morning devotion. 1 John 4-7: Dear friends, let us love one another, for love comes from God and everyone who has been born of God, knows God. Sunday we were heading to see close to 200 orphans. This message hit home that day, because it was important we show love to these children who have not been as fortunate as us to grow up knowing the level of love we do. 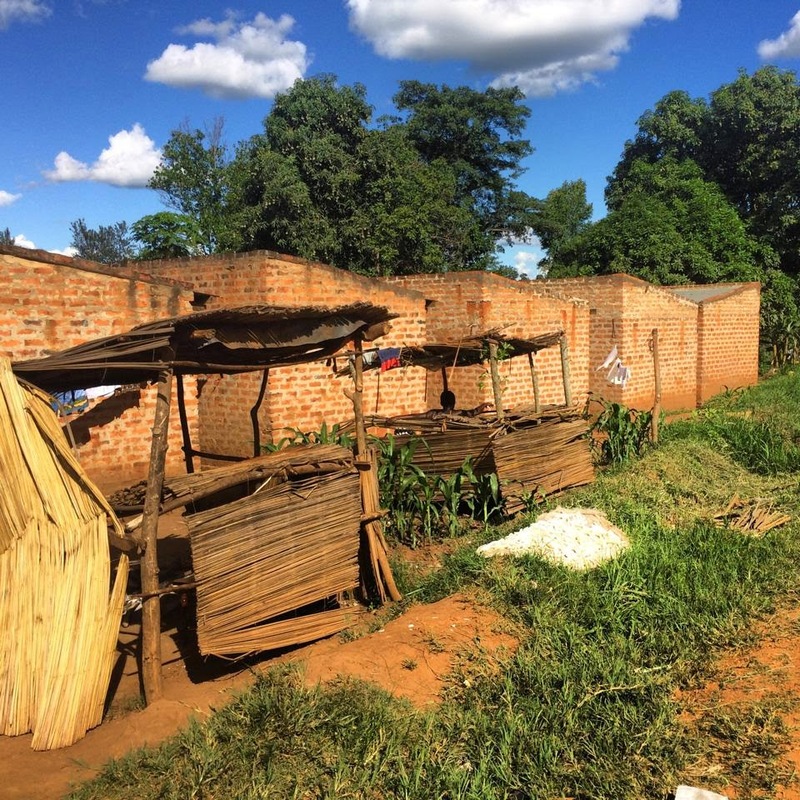 These children were there due to acts of civil wars, violence and most had HIV/AIDS. The Center was about a 15 min from van ride from the hotel. As we pull up, Katie and I just look at one another and are in disbelief. There were 147 babies, children and teens waiting for us. They were smiling, laughing, waving, jumping up and down screaming helllllo! hellllo! Not even seconds after exiting the van we are bombarded with these children's hands and arms wrapped around our bodies. It's a feeling of overwhelming love and joy I will never forget. From here the director, Issac, and the children showed us around the grounds. We saw where they ate, slept, had class, cooked, and played. After the tour they preformed several songs, dances and skits led by the older children. The children loved to have their picture taken, liked to take pictures and mostly enjoyed looking at the pictures. They loved to hold hands, give hugs & high fives and to kick the soccer play or play on the jungle gym. These children have a sense of humor, belly laugh, and are ticklish. They are curious and liked to touch our skin. They really liked pointing at my freckles and examining John's tattoos. Toms: one for one movement. Really awesome to see the good Toms is doing, in the flesh. Moses is who stuck out to Katie the most, probably because he clung to Katie like a monkey. Issac found him on the side of the road in a coma. Left for dead. While he can walk (not for long) and understands what you say for the most part, he can not speak. He was a little shy, but still liked to hold hands and be carried (mostly because it hurt him to walk too far or run). He loved Katie's sunnies and the moment we put them on him, it's like a new little boy was born. Literally, we saw a different side of Moses, he came alive. Here is some key information on Family Spirit. This information was gathered from their facebook page. - The center was opened in 2002 by Issac Rufunda Nyakoojo, Susan Anganita and Raymond Bukenya (Raymond passed in 2009). They were living with HIV/AIDS and realized the plight of vulnerable children suffering as a result of war, violence and HIV/AIDS. - Create a community education center to enable their children to have access to education and skills for survival. - To solicit for funds to provide the basic needs of shelter, food, clean water, health, and drugs to treat the diseases. -To mitigate stigma and discrimination among the communities through training and sensitization campaigns. I think everyone left Family Spirit with full hearts. These children will forever have a piece of my soul and a place in my heart. It's been almost 3 months and I still find myself thinking of them every day. We loaded back in our vans with tears and hands waving until we could no longer see them. Has hard as it was to leave them, starting our time in Uganda here was a great insight to what the week would hold. Once back at the hotel we walked as a group to the Masindi-Kitara Medical Centre. This is the clinic that PMI opened. Since the facility is self sustainable, we conducted clinic days in near by villages/towns. The walk there was great, we really got to see what life in Masindi was like and interact with locals we met along the walk. "We are so happy you are here!" Once at the MKMC, we were greeted and given some insight into stats, local medical laws, the goal of MKMC, descriptions of each building by Fred Mo. Between Fred and the Business partner we learned a lot about Uganda and Africa. -35.6 million people live in Uganda, despite it being the size of Oregon. 3.8 million people live in Oregon. 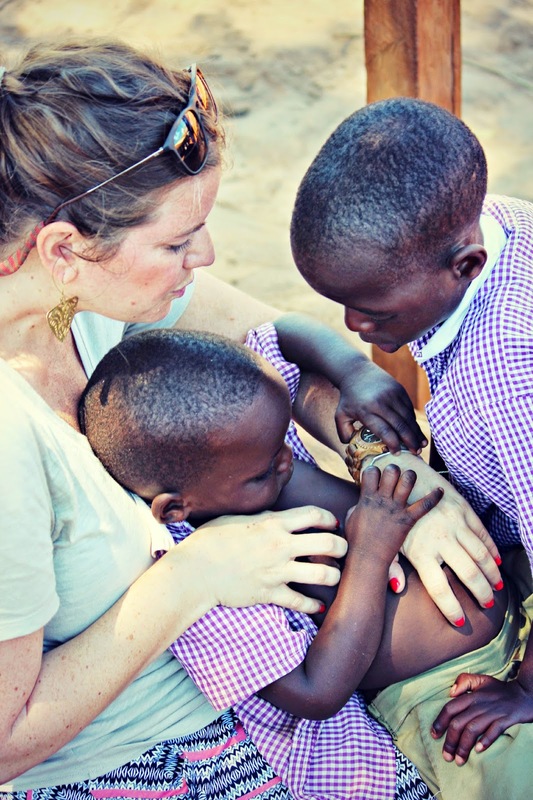 -There is 1 doctor for every 26,000 people in Uganda. Isn't that unbelievable?! -100,000 people die of Malaria in Uganda each year. In all of Africa that # climbs to 483,000 per year. -One child dies every minutes from Malaria in Africa. Crazy that a mosquito is doing that much damage. Shortly after our introduction, we split into 4 groups and began a walking tour of the Center's grounds. The first building we walked into was at the bottom of the hill. There were several ladies sitting outside on a bench. We walked in and it was big room, with a couple privates doors, but 4 cement chest high walls to make for 4 divided spaces. In each space the group was different. A man sleeping, several older women sitting on the bed talking and smiling, two mothers breastfeeding their children and lastly, a man sleeping in bed and a women crying in the corner. We were asking questions to the staff, and while they answered, there was kind of an "off" feeling I was getting. Once we walked outside we were told that the man who was sleeping, was in fact dead. He died 30 min prior to us walking into that room, from Malaria. It was his wife who was crying. We asked what happens to the bodies if they die at the clinic. The answer: someone from the family comes and picks them up and the body is buried in the front yard of the family. Not everyone can afford a proper funeral, we were told. This shook us to the core. As we continued on through the clinic tour, I was in awe of how different it was from anything we have in the states. While I've traveled the world, I've never been in a foreign medical facility. This ambulance was caught at customs and held their for 2 years by the g'ment before being returned. Sunday evening we had fish (eeehhh), french fries, mushroom soup and Jack Fruit. After life stories and shout outs, we had a Team leader meeting. Before we arrived to Africa, I was asked to be the Team Leader for Registration. Hope had this position on a trip and said she loved it and thought it would be a great fit for me. Katie and I wrote out 175 Registration forms and wrist bands to be ready to start right away when we arrived on site Monday morning. While we were filling out our forms, Pharmacy boys John and Will hung out with us and we just got to know one another. They had been in Masindi about a week before us, organizing and working at the MKMC. John told us about a crazy thing that happened, they day before. While at the clinic, he assisted and delivered a baby! He's a pharmacists, so clearly not in his job description, but as we quickly learned, you helped where you are needed. While this was special thing for John it also touched home with me. The baby was born on May 10, 2014 (The day we arrived in Uganda). She was named Martha. 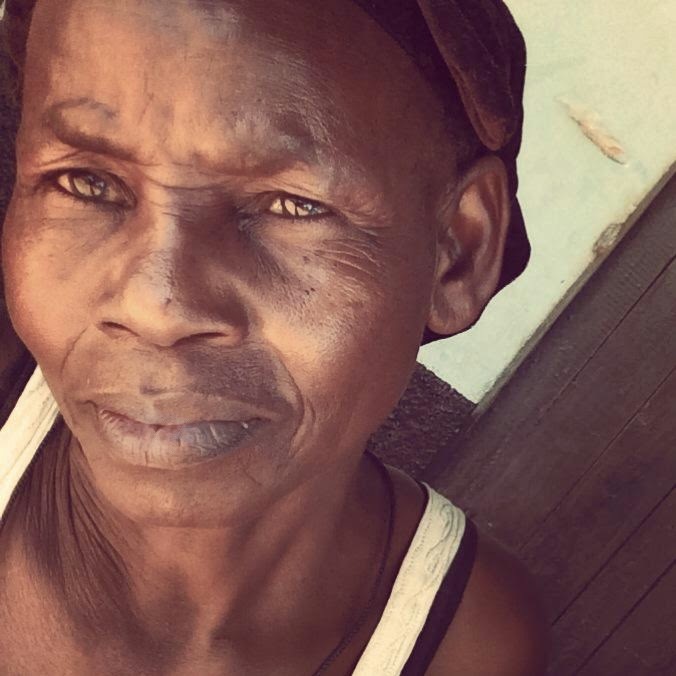 They often choose an Christian name to go along with their African name. This was special to me, because I had an Aunt named Martha. She passed away in 2005. Her daughter, my cousin and best friend was born on May 10th and was turning 30 this year. What a small world we live in. Martha born on May 10th. I was so amazed by this, I sent a $1.75 text to my mom and Maria to tell them! 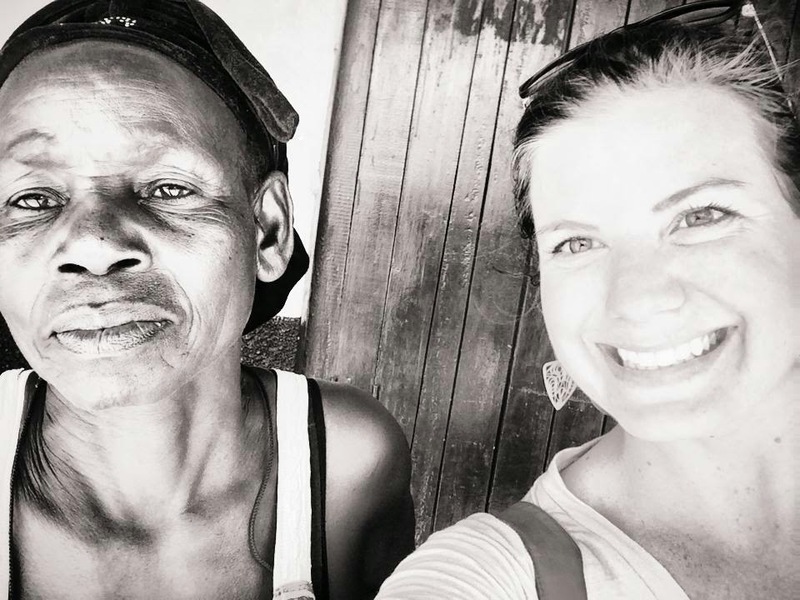 We met about 1500 people that week, no one else was gave Martha has their Christian name. Lots of other names were repeated but not Martha. $5 will buy one child a mosquito net and help prevent Malaria.